Should your resume be longer than one page or should you try to condense it to keep it on a page? There isn't really a yes or no answer. The length of your resume depends on the type of candidate you are and your level of experience. In general, most employers want a concise resume without a lot of extraneous information. They only spend seconds reviewing it, so the more compact it is, the easier it will be for the hiring manager or recruiter to review. In addition, many employers use software to screen job application materials, so making sure your resume is focused on the job you're applying for will help you get chosen for an interview. In some cases, a longer resume might be in order. For example, graphic designers or visual artists might benefit from creating an illustrated resume, and academics, researchers, or long-time executives may need more than one page to capture the breadth of their experience. But, in general, it's best to avoid overburdening busy recruiters with a resume that drags on and on. Especially if you're applying to a large company, there's a high likelihood that your resume will be printed out to be reviewed by multiple people, or at least shared electronically. Having a short and concise resume makes it easier on the hiring manager and also increases your own chances of standing out. 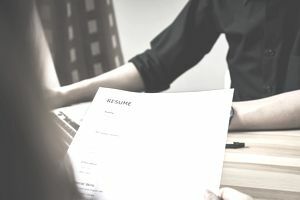 Unless you are explicitly asked to submit a specific type of resume, sticking to a simple, single page is a surefire way to make sure that it will be able to be downloaded - or printed out - and reviewed by anyone who needs to look at it. It's much easier to read a single page resume than it is to review a multi-page document. According to the survey above, most employers want a one-page resume unless the position requires experience. If a job wants an employee with extensive experience, you can and should include all of your applicable experience on your resume (although most employers do not want applicants to include more than 10-15 years of experience). There are also certain professions that are exceptions to the one-page resume. For example, in academia, medicine, and international jobs, a curriculum vitae is often much longer than one page. Graphic designers or visual artists might also create an illustrated or graphic resume, which might exceed one page. However, these professions are the exception to the general rule that a one-page resume is best. Make sure everything you include in your resume is relevant to the position, down to your word choice. Because many employers use an applicant tracking system (ATS) to screen job application materials, try to use keywords from the application in your resume. This will increase your chances of making it past the first round of resume reviews. Create an inventory. If you're struggling to pare down your resume to one page, start by creating an inventory of your accomplishments and work activities. List your responsibilities and your achievements in great detail. Your inventory document might span as many as three or four pages. Try to include a diverse spectrum of skills that have led to successes in each role. Match your qualifications to the job. Analyze each job that you are considering and circle the statements that correspond most closely to the requirements for that particular position. Piece together the most relevant statements into a shorter, targeted version of your resume. Start long and cut back. The first draft might be longer than one page. If so, try to eliminate statements that provide less significant evidence regarding how you would add value to the role, until you get down to one page. Try to be as specific as possible with the information you list and be as concise as you can in your writing. Use a bulleted list and keep your job descriptions concise. Focus on your accomplishments, not your daily responsibilities. Cut out any extra years. Even if you are an experienced candidate, you should include no more than 10 or 15 years of experience on your resume. Trim the education section. You don't need to include high school education or continuing education classes unless it enhances your candidacy. Skip the references. It's not necessary to say "references available upon request" on your resume. It's understood that you will provide references, if required, as part of the job application process. This is an example of a one page resume. Download the one page resume template (compatible with Google Docs and Word Online) or see below for more examples. Energetic and deeply dedicated Registered Nurse offering 8 years’ hospital healthcare experience. Nursing: Deliver quality nursing care in high-stress ER settings, deftly performing patient assessments, taking vital signs, administering medications, setting up IV pumps, and providing wound and ostomy care. Regulatory Compliance: Ensure strict compliance with all JCAHO and HIPAA standards. Communications: Communicate effectively in English and Spanish to educate patients and families in treatment plans and medical statuses. Key Strengths: Proven leadership and collaborative talents, easily motivating and guiding nursing staff in daily shift tasks and responsibilities. Skillfully provided nursing care at Level I trauma center to patients suffering cardiac arrest, multiple traumas, strokes, overdoses, and assaults. Performed defibrillations, intubations, auto transfusions, Medlock insertions, and other medical interventions. Served as preceptor for new nursing students. Supervised ~40 RNs, LPNs, CNAs, and medical technicians in provision of quality medical care. Provided ER nursing care and lifesaving medical interventions to patients, collaborating seamlessly with multidisciplinary healthcare team members to establish treatment plans. Consistently achieved top ratings on performance evaluations as well as earning 3 formal commendations for providing excellent patient care. Willingly worked overtime and on weekends to ensure adequate ER staffing. Of course, it's always a good idea to have more information available for connections or hiring managers who want a bigger picture of your background and qualifications. You can streamline your resume by providing additional information online. Including links to your LinkedIn profile or personal website will allow you to leave that information off of your resume, saving you space. Include a statement on the bottom of your resume, such as "Additional information, recommendations and portfolio samples available at www.linkedin.com/in/yourname." If you have sparked the interest of a recruiter with your short resume, then she will be motivated to gather more in-depth information about your background.